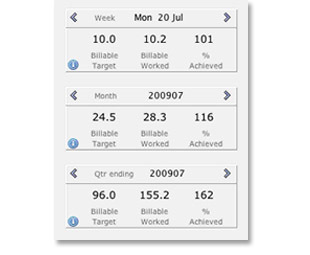 Planning and targets should be monitored in real-time - not just once a month or quarter. Setting targets for staff is taken for granted - but are the targets reasonable? Who is ahead of target? Who is struggling and needs assistance? When the extra business arrives does your organisation have the capacity to handle clients expectations? One of our clients has a system that shows optimal capacity, individual and group targets plus actual performance - both in hours and revenue  all in real-time. Managers can instantly see how the plan is working out and what needs to be adjusted.